Remember that old episode of “The Twilight Zone,” the one called “To Serve Man,” where aliens landed on Earth and all the humans were running around suspicious of what the visitors really wanted? That’s kind of the basis of Arrival, too. Arrival is about the arrival (ha!) of several alien spacecraft in twelve different locations on earth – places like China, Venezuela, off the coast of Australia, two in Russia (because the country is so big). 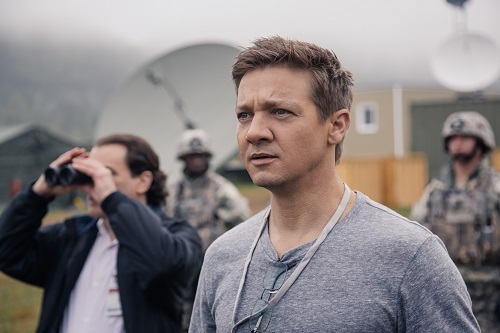 One touches down in Montana, and the American government brings in a linguist named Dr. Louise Banks (American Hustle‘s Amy Adams) and a physicist named Dr. Ian Donnelly (Jeremy Renner from The Avengers) to attempt to communicate with the aliens. The other landing sites all try as well, and at first, the countries share information and advances are made in leaps and bounds towards learning the aliens’ complex language. But, when the messages start getting ominous and frightening, one by one the research teams stop trusting each other and go quiet. In America, Louise and Ian struggle to determine if the aliens are dangerous, or if the humans are just misunderstanding their intentions. 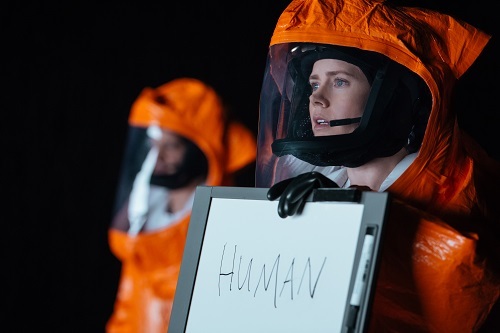 Director Denis Villeneuve (Sicario, Prisoners, Enemy) tends to make movies that force people to live with them for a while, taking some time to digest and process, and Arrival is no different. The screenplay, written by Eric Heisserer (Lights Out, The Thing), is a smart morality play on the alien invasion motif that keeps the characters – and the audience – questioning whether the aliens are to be trusted; are they there out of curiosity or because they want to destroy the world? Of course, the give-and-take between science and superstition shows up to muddy the waters, and the fact that Arrival plays with its historical timeline doesn’t help clear things up much. It seems as if Villeneuve purposely wants to keep his movies ambiguous so that his audience doesn’t forget about them the second after they leave the theater. It’s a brilliant ploy that has worked for him for three – and now four – movies. None of this means that Arrival is difficult to follow. It’s a straightforward story, but there are layers that will continue to be pulled back long after the end credits have finished. The narrative does slam on the breaks a bit for the third act, but not in a way that leaves the viewer unsatisfied. Villeneuve gives the audience all of the information and lets them draw their own conclusions, conclusions which may change in the days or weeks that follow, or even with subsequent viewings. That’s the kind of movie that Arrival is. It’s not your grandfather’s alien invasion movie. The TL;DR on Arrival is that it’s a modern science fiction masterpiece. The fact that Villeneuve has made such a subliminally effective sci-fi flick bodes well for him, since his next project is the long-awaited Blade Runner 2049. If the subtle combination of humanity and technology in Arrival is any indication, Villenueve has the directorial chops to pull it off. 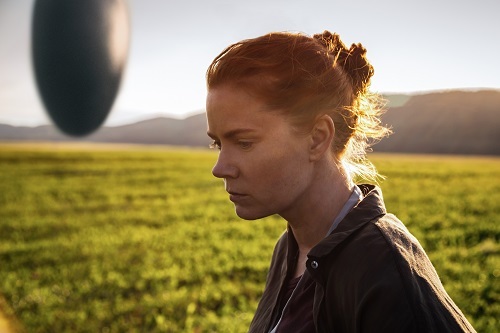 Essentially, Arrival is about confusion becoming knowledge, and the cinematography of Bradford Young (A Most Violent Year, Selma) reflects that. Most of the film is shot with a very shallow depth of field, meaning that very little of the frame is actually in perfect focus. In some shots, only one actor’s face (or even just a part of that one actor’s face) will be in focus, leaving the rest of the picture in a hazy fog. It’s a very effective way to visually show the communication gap between the humans and the aliens, as well as demonstrate the overall uncertainty of the people of Earth over their new visitors. Gradually, things get more focused, but never end up perfectly clear, as the answers to the humans’ questions are also never perfectly clear. It’s a fun photographic trick that Villeneuve and Young play with, and it gives the film a dreamy, surreal look that is quite unique.